New JFX200-2513 to be premiered at Viscom Düsseldorf. 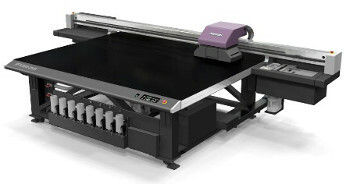 New Mimaki JFX200-2513 expands flatbed printer rangeMimaki has announced the upcoming launch of the JFX200-2513; a large format flatbed UV inkjet printer that can print up to 25 m2/h on materials up to 4 feet by 8 feet (2,500 x 1,300 mm) in size and up to 50 mm thick. The new machine will make its first appearance in Germany at Viscom Düsseldorf, November 7-9, on stand H31. Mimaki said the JFX200-2513’s has a compact footprint, eco-friendly LED curing and an attractive price point which make it ideal for businesses in the sign and display graphics industry that wish to affordably expand their range of services. The printer is available with multiple ink types that support a wide range of materials and applications. These include LH-100, a hard UV cure ink with high rub and chemical resistance and excellent colour fidelity. Mimaki’s LUS-150 is a low-cost UV cure ink with suppleness that extends to 150 per cent without cracking for materials to be applied to curved surfaces. Finally, Mimaki PR-100 is a primer ink that can be used as a pre-treatment agent to improve ink adhesion on difficult surfaces. The ink is available in economical 1-litre ink bottles for reduced ink costs. The Mimaki JFX200-2513 features variable dot function designed to ensure a high quality print by jetting three ink dot sizes at once. It also has a white ink for bright images, backlit graphics and other items printed on transparent materials. The printer sports Mimaki Circulation Technology which the company maintain eliminates issues with white ink sedimentation.